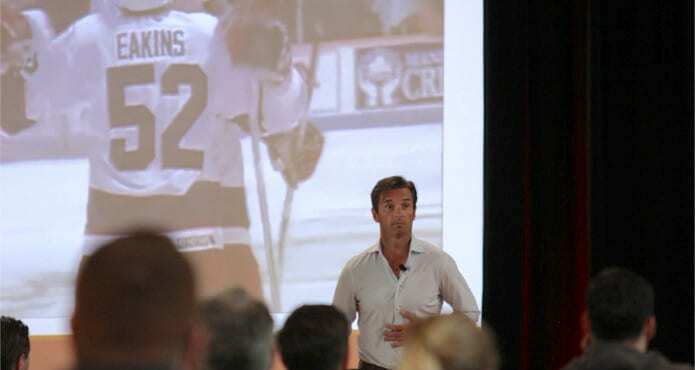 Dallas Eakins has gained plenty of recognition over the years for his contribution to the analytical side of the game. We’ve got standard stats such as goals and assists and we’ve got advanced stats like corsi and WOWY’s. But for Coach Eakins, those statistics don’t amount to much if we’re overlooking two crucial aspects of the game. As an Edmonton Oilers fan, I witness the full brunt of the mainstream Edmonton’s media questioning of Eakins’ tactics. He was accused of turning a blind eye to the intangible components of the game in favour of measurable analytics. Well, it’s a good thing we were able to take in the full spectrum of his philosophy in his presentation below. For Eakins, habits like preparation and being a positive influence are worth their weight in gold. How do we teach character and leadership? How do we explain its importance? Eakins is notorious for doing his homework on new players. He talks here about making phone calls to his network after his San Diego Gulls sign players to determine what types of character he’s dealing with. Oh, and if you get fired from a job, Mr. Eakins recommends the Grouse Grind. Seriously.